The U.S. Federal Trade Commission (FTC) and the Illinois Attorney General’s Office said that many websites that feature news report about weight-loss benefits of acai berry products aren’t genuine. 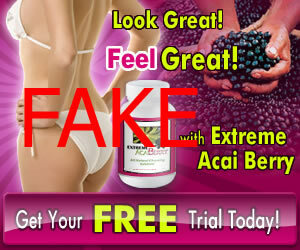 They have claimed that these news websites are fake and that the claims about acai berry products helping people to reduce weight is not supported by science. During the last week, FTC has filed 10 lawsuits in courts across the U.S. and Illinois Attorney General has filed an additional lawsuit in her state against the affiliate marketers of acai berry products. The affiliate marketers place billions of ads linking to these fake news websites and consumers have paid almost $10 million for acai berry products. Some of the websites in the list are using names such as News 6 News Alerts and Health 5 Beat Health News. The fake news sites use logos of legitimate news websites to easily fool the people into believing them. These fake news sites feature a news reports who always produces the same result across several websites. According to the report, the reporter always lost 25 pounds in four weeks without changing either the diet or exercise routine. Moreover, the picture of the reporter is of a real-life French reporter who did not even give the permission for her image to be used. So for people still looking for weight loss tips, please stay away from these fake news websites.